When I was in Tokyo, Yohei was telling me about Ducus One’s new trick bike. 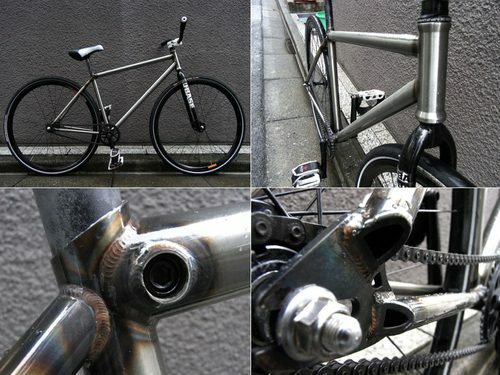 Durcus One is W-Base‘s house brand and so far they’ve made an alloy track bike and a 24″ bmx cruiser. Their trick bike is the new installment in their stable. The details look really nice. I dig the integrated seatpost clamp and the lopped-off seat stay and chain stay ends. Thanks for sending over the pics man! But who will ride this thing? None other than Marco. This dude is one of the most talented riders I’ve seen in person. Super fast, aggressive and smooth as hell. He’s got ups too! As you can see, he’s already rocking the new Hold Fast production models I gave him. Keep ripping man!